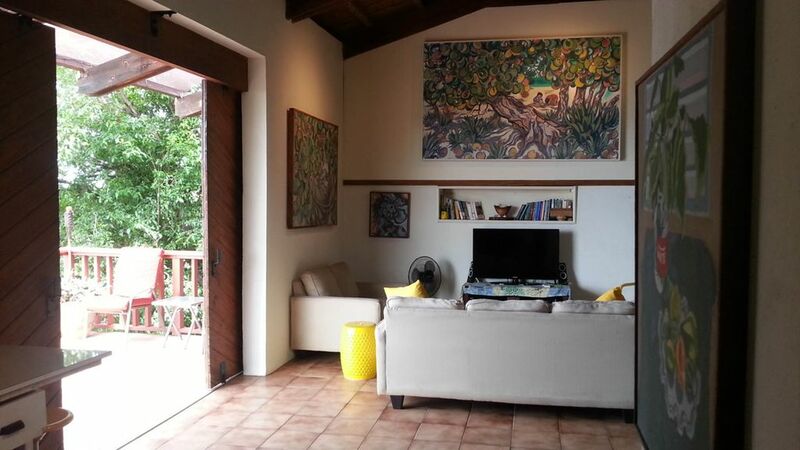 Open-air studio loft with original oil paintings from Elbridge Gordon. Experience something different with the open-air home and work-space of artist Elbridge S. Gordon. This quaint studio loft is intended for those that can appreciate a unique living experience, from the high exposed ceiling beams, to its warm and cozy, yet industrial space. The loft also has a 20 foot open porch with views of Charlotte Amalie harbor. It's fully supplied with linens, towels, cook/dishware, refrigerator, stove/oven, coffee maker, microwave, tea kettle, toaster, blender, iron, hair dryer, and beach gear. Cable, Netflix, Blue Ray DVD Player, and WiFi are also available. Most uniquely and importantly, the loft features original sketches, photographs, and oil paintings by Elbridge Gordon! Space is also equipped with an easel, art table, and supplies to create your own island-inspired masterpiece to take back home! Come dream in colors never seen before, and dare to be creative! This studio art loft is filled with original oil paintings, hand drawings, photographs, and other treasures from Elbridge S. Gordon's collection. Take the opportunity to explore your inner artist, and consider creating your very own island inspired masterpiece to return home with! *Note: A portion of the bookings will be donated to our local schools/art departments for purchase of much needed art supplies. *Host will provide/email document with house directions and parking instructions. Island spices, a variety of cooking oils, coffee, tea, and much more. Open-air dining in the general living area. Slide the porch doors wide open and have dinner while gazing at the harbor. Or, draw the porch doors to have an intimate, cozy dining experience. Speakers equipped with VGA cable so guests can play music from their personal devices. Personal collection of books.... mainly nature, animal or spiritually related. Feel free to have a read. Hillside garden filled with lush tropical flora. Spacious porch with views of the Charlotte Amalie Harbor (the capital). Light tiki lanterns at night and stargaze ! Beach chairs and coolers provided to take to beach. Loft is equipped with an easel, art table and art supplies to create your own island inspired masterpiece to take back home! This spot is lovely. The space is bright and airy, very private and quiet. The views are breathtaking and we loved lazy mornings enjoying the sunrise over the harbor. The kitchen was well stocked with spices and basic essentials. Shenell thought of everything!! Just returned from St. Thomas after a month's stay at Gordon's Loft. It was a great place to stay! Shenell has done a really good job creating a home and we felt very comfortable there. She thought of just about everything - the Loft was well-equipped, very spacious, and has a fabulous view from Frenchman's Reef to Crown Bay. We were very pleased and would gladly recommend staying at Gordon's Loft. Be creative in the most beautiful place! When I walked in the door of the Art Loft I was struck by the beauty and peace of this space. What a privilege to see the love Shenell has for her artist father reflected everywhere. I spent seven days at the Loft and each day was even better than the one before. I left feeling newly energized, with my own creative juices flowing again. Shenell has thought of every single thing in terms of her guests’ comfort. There wasn’t a single thing I needed that wasn’t already provided, even before I knew I needed it. She is truly the most gracious host ever. Plus, the Loft and it’s amazing view are perfect for “getting away from it all.” I only bothered to leave every other day, and if my stay had been longer I would have left even fewer times. Truly the Loft itself turned out to be my vacation destination. A practical tip: the Loft can be difficult to find and the roads can be treacherous. I’m glad I rented a 4WD Jeep. Very glad! I hope I’m lucky enough to come back here someday. I’m feeling fully recharged. This place didn't fall short to what I expected a artsy loft to look like, going by their pictures. The loft was cozy and comfortable. I felt like I was at home the entire time. There was a nice touch of art throughout the home. Being able to make breakfast in the morning was easy once we got the ingredients. The Gordon's even had seasoning and oil on site. Waking up to a magnificent view was incredible. Nice breeze throughout the home. I would definitely recommend to my friends and colleagues to stay there. Thanks so much for such a thoughtful review. I appreciate you considering us as a place to stay, as well as caring for and leaving the space so tidy. I want to remind you that a portion of your booking will go to donating art supplies to students and/or art supplies at our local schools. Our host, Shenell, put such comfort and warmth into the things that matter: thick towels, plenty of cooking utensils, instructions for the video and audio equipment - everything well labeled, and everything for the beach: from a beach bag to chairs to a cooler! The loft is a fabulous place to stay with a magnificent view. You are nestled in a neighborhood, so prepare for the sounds of neighbors: dogs, roosters, and folks working and entertaining. We found it added to the experience. You cannot imagine the beauty and unique comfort that awaits you at Gordon's Island Art Loft! Mary and company were wonderful guests. They were most generous by donating a guitar at the end of their stay future guests to use. This creative contribution was much appreciated and will add a special touch to the space/experience. We welcome Mary back to the Virgin Islands anytime. Gordon's Art Loft was a wonderful island experience and we will return to create another masterpiece and memories! Please do not handle or move any of the artwork. The $20 "equipment fee" is actually a donation that will go toward our local schools for much needed art supplies. Enjoy your stay!